Melanie Rene Thennes was born in Helena, Arkansas on September 30, 1962. She was preceded in death by her brother, Mark Mitchell. 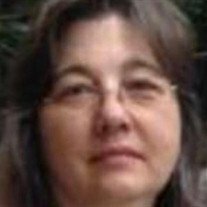 left behind are her husband of 15 years, Karl Thennes and her three sons; Lance Mathis, Clay Mathis and Adrian Mathis, and five grandchildren, Austin, Sadie, Ryan, Luke and Kara. One sister, Sissy Walker and one brother-in-law Basil Walker; Father Billy Mitchell and Mother, Judy Mitchell. She worked as a nurse for 30 years. The last eleven years she worked at the Arkansas Surgical Hospital.She was a sweet, quiet and giving person always doing for others. Making baby blankets and crocheting afghans for friends. Her favorite craft was cross stitching. Going to yard sales on Saturday's was one of her favorite things to do until her grand kids were born. Then they were the highlights of her life. Nanna was the best there ever was and ever will be to them. She will be greatly missed by all who loved and knew her. Funeral Service will be held on Saturday August 18, 2018 with visitation from 12-2 p.m. both at Willis Funeral Service Chapel. Burial will be at Sulphur Rock Cemetery. Willis Funeral Service of Batesville in charge of the arrangements.